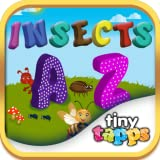 Insects A-Z by Tinytapps is about insects…some common; a few not so common; some beautiful and gentle and a few creepy crawlies but all of them from A-Z will surely be a new learning experience for your little ones. A-Z makes for 26 insects. The app has both, real life images and the clipart making it a total of 52 pictures with the insect names and user tap audio and visual effects. Fly! Fly! Butterfly is a colorful and interactive rhyme your little ones will simply fall in love with. The app aims at developing the child’s awareness about the spectacular world of insects. For those frightened of insects, spiders and other creepy crawlers, this app will help them overcome their fears while learning about the world around them. An insect theme can last as long as your little one’s interest does. Study one insect at a time, and as you start a new insect study, compare the current insect to past insects, pointing out what they have in common e.g. their wings, legs, color etc. Do write to us your feedback and don’t forget to see our other apps. Learning is so much Fun with Tinytapps! !